Osprey have focused on designing a light and durable wheeled travel case in the Ozone 36. The foundation relies on their unique injection molded HighRoad LT chassis made from an ABS polymer plastic for durability and using lightweight wheels and frame. For comfort and control a retractable ErgoGrip T-shaped handle ensures that wherever you go, your bag will follow. Inside the bag you'll discover a multitude of organization options; including a liquid/accessory pocket and dual zipped side pockets – ideal for storing your laundry or a pair of running shoes. The internal compression straps allow you to fully maximise capacity whilst securing your clothes and limiting creases. The three large internal zipped pockets also help to organise your gear. To ensure you and bag aren't separated there is a built-in retractable ID card. On the back of the Ozone travel pack Osprey have also included a large U-shaped zip storage pocket, ideal for whatever you want to cram into that last available space. 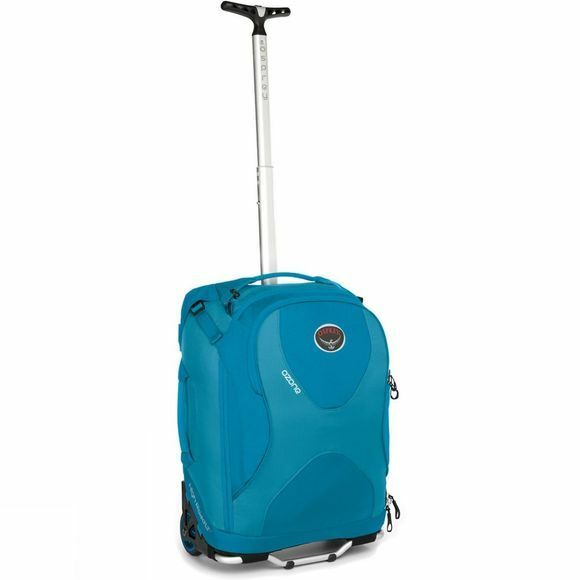 When heading for your next flight you'll know that you are rolling light and you'll be safe in the knowledge that the Ozone 36 conforms to maximum EU carry-on dimensions.